Cervical spine injuries are rare but potentially devastating. Immobilisation of the cervical spine on the slightest suspicion of injury is recommended by most resuscitation courses including ALS, ATLS, APLS, PHTLS, as well as by NICE and JRCALC (National Ambulance Service Guidelines). To that end, cervical spine immobilisation is now the most commonly performed procedure in pre-hospital care. 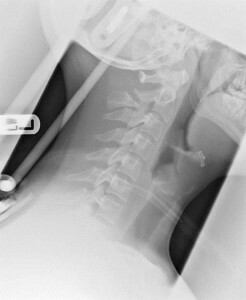 A large number of patients present to Emergency Departments (ED) with their necks immobilised; as significant cervical spine injury is rare and there are potentially adverse consequences of cervical spine immobilisation, reliable methods are needed to clinically exclude cervical spine injury wherever possible (clearing their necks ). 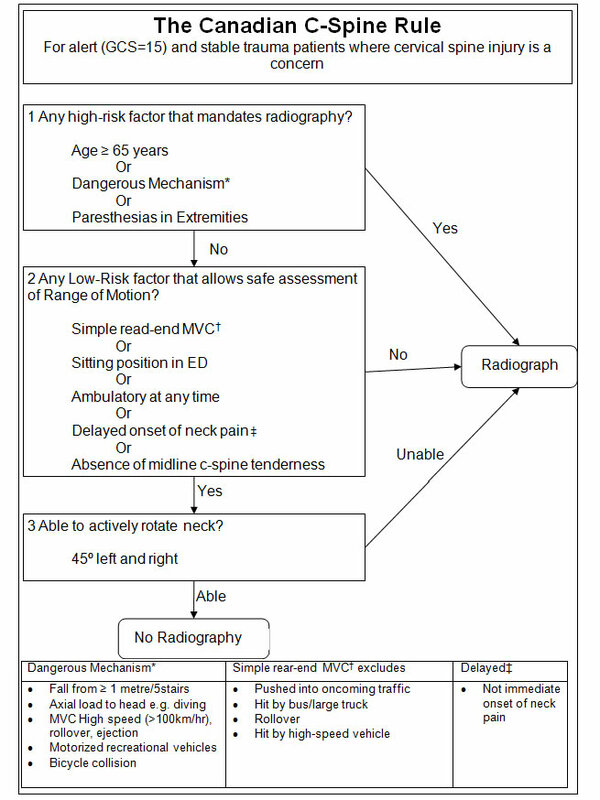 The initial clinical assessment and, where necessary, subsequent radiological assessment, of potential cervical spine injury is the subject of this session. Abnormal flexion, extension, rotation and compression cause injury to the spine in predictable ways.3 As described below, the ligaments of the neck can be injured from all of these mechanisms. The lesser forms of these injuries may cause injuries to the ligaments without the associated fractures. All injuries to the neck have the potential to damage the spinal cord. This can present as weakness or altered sensations in nerve root distributions or in incomplete spinal cord injury patterns (e.g. central cervical cord syndrome or Brown-Sequard syndrome). Clearly patients with neurology will all require specialist imaging (e.g. CT and/or MRI) and referral for further care and so will not be discussed further in this session. Hangmans fracture (see Figure 3): hyperextension fracture through pedicles of C2 following hyperextension with distraction or compression. Results from judicial hanging (rather than suicidal which causes asphyxiation) or from striking chin on steering wheel in a collision. 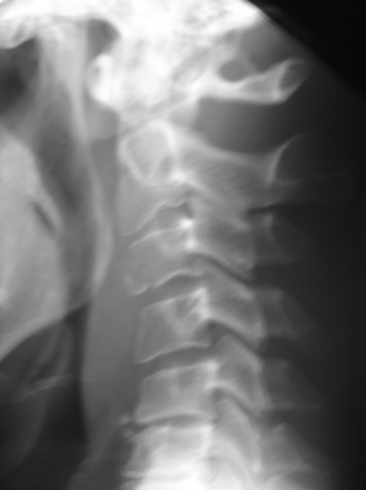 The Jefferson Fracture of C1 (see Figures 5 and 6) is a specific cervical spine fracture caused by an axial loading mechanism (eg. a weight landing on patients head, or patient landing on their head after a fall). The laminae and pedicles are fractured and transverse ligament holding peg in position can be torn. The skull and C1 may slide forward on C2. There can be significant shift before compression of spinal cord occurs as 1/3rd of the space of the spinal canal is occupied by the odontoid peg, 1/3rd by areolar tissue and 1/3rd by the spinal cord itself. The cervical spine takes on its adult form from about the age of 8 years. 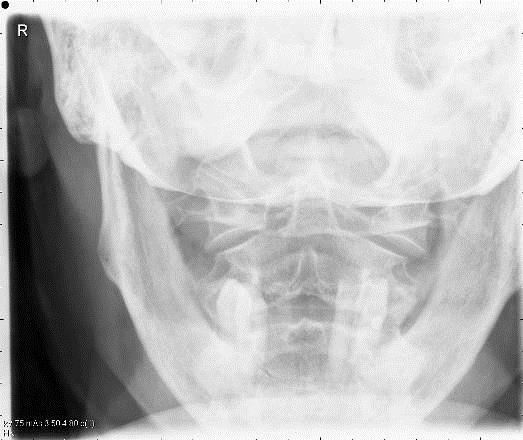 These patients are not able to have their cervical spines cleared clinically as a reliable clinical assessment cannot be made. 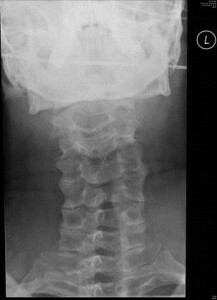 These patients require imaging to clear their spines. A total of 34,069 patients underwent radiography, and all but 8 of 818 patients with cervical spine injury were identified by applying the NEXUS criteria (a sensitivity of 99%; 95% confidence intervals 98.0-99.6%). The negative predictive value was 99.8%, but the specificity was low (12.9%) which means that the majority of patients with positive NEXUS criteria still did not have actual cervical spine injury. Some authors have tried to refine the NEXUS Guidelines without success. Is there any high-risk factor present which mandates radiography? Is there any low-risk factor present that allows safe assessment of the range of neck motion? 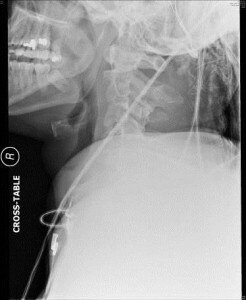 Is the patient able to actively rotate their neck 45 to the left and right? Subsequent validation of this rule revealed a sensitivity of 100% (95% confidence intervals 98-100%) and a specificity of 42.5% (95% confidence intervals 40-44%). Unlike the NEXUS rule, this study excluded children <16 years of age, and all patients with a Glasgow Coma Scale (GCS) score of <15. 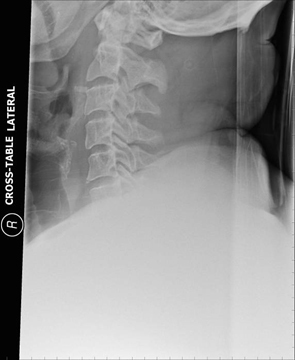 Canadian Cervical Spine Rule or Nexus Low Risk Criteria? 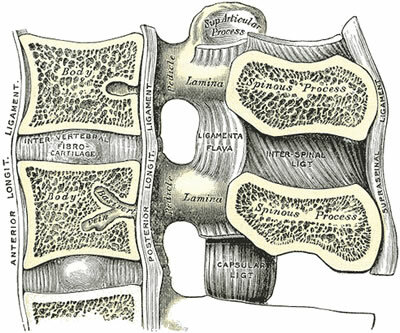 There have been two studies which have compared the Canadian C-spine Rules with the NEXUS Low Risk criteria7,8, Both these studies found that the CCR had a higher sensitivity and specificity than the NLC, however one study was a retrospective application of the NEXUS criteria to the CCR study raw data, and did not exactly follow the Nexus criteria (No evidence of intoxication vs. un-evaluable due to intoxication). The current NICE Guidelines discuss both the NLC and CCR: in the pre-hospital section they recommend using the NLC, whereas in-hospital assessment is based on the CCR. The Canadian Cervical Spine rules are used more in Emergency Departments in the UK at present (anecdotal), and the NLC are currently used in the pre-hospital setting being recommended by the current JRCALC (national ambulance service) Guidelines. However a number of ambulance services are now training their staff in the use of the Canadian Cervical Spine rules. The cervical spine can reliably be cleared if either the NEXUS low risk criteria or Canadian C-Spine rules are satisfied. 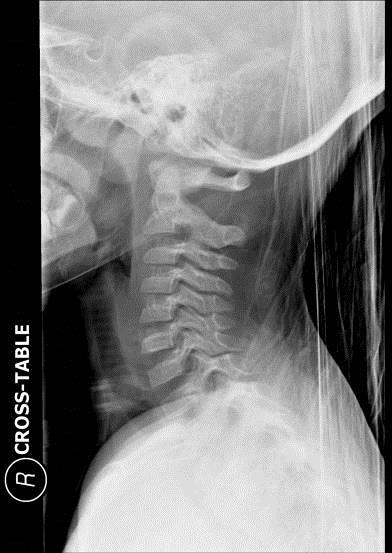 Childrens cervical spines are different to those of adults (see above), with injury to the upper cervical spine and purely ligamentous injury being more common. In addition, younger children are often harder to assess being frightened and uncooperative. Viccellio and colleagues9 performed a subgroup analysis of the NEXUS study, specifically evaluating children with neck injury. This group consisted of 3,065 children aged under 18 of whom 30 (0.98%) sustained a cervical spine injury. This incidence is lower than that in the adult population, but this may have be due to more liberal use of radiography in children. There were no children with proven spine injury who were negative on all five NEXUS criteria, and no cases of SCIWORA. 45.9% of injuries occurred in the lower cervical spine (C5-C7). There was no spinal injury in children under 2 years and only 4 cases in children under 8 years of age in this study population, which means that, despite its apparently impressive performance, the NEXUS rule should be used with caution in these younger age groups. A recent study compared the NLC and CCR in children10. The study evaluated children less than 10 year of age, who had radiographs of their cervical spine over a 10 year period. Of the 125 children who had radiographs, 7 (3%) had clinically significant fractures. If the NLC was applied 3 fractures would have been missed (sensitivity=43%, specificity =96%) whereas the CCR would have missed 1 fracture (sensitivity=86% and specificity=94%). They concluded that, although the CCR performed better than NLC, neither could be used with confidence in children. Clinical bottom line: There is no robust evidence base for a clinical rule-out for cervical spine injury in children less than 10 years of age. Patients, whose cervical spine cannot be clinically cleared, will require imaging to permit identification or exclusion of significant injury. 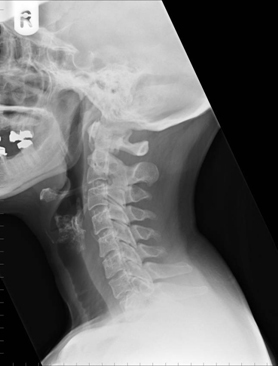 Plain radiographs do not detect all cervical spine fractures. In 29 published studies 16% of fractures (range 0 to 67%) were missed11. 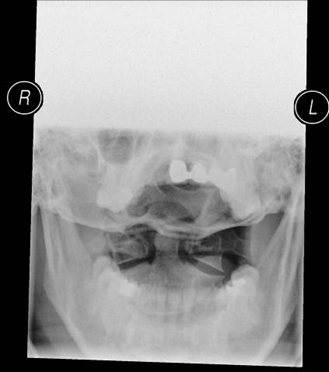 Plain lateral X-rays alone have a sensitivity of 63-85%, while the three view trauma series (anterior-posterior (AP), lateral and peg views) improved diagnostic sensitivity to over 93%. 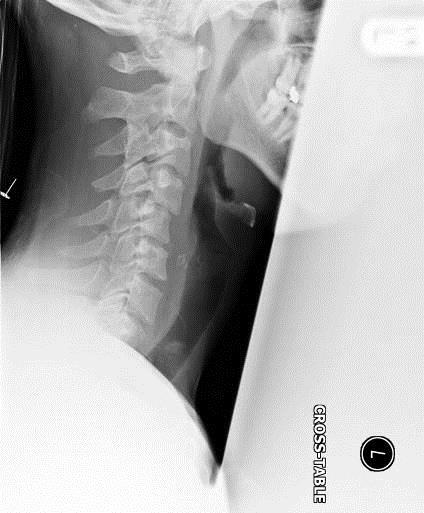 Plain radiographs are not adequate to exclude significant cervical spine injury in unconscious patients and these patients will require CT (or MRI) imaging (see below). 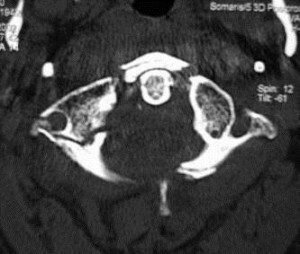 Normal imaging of the cervical spine consists of three views (see Figure 8). The Lateral, Antero-posterior (AP) and odontoid peg views. In children under 5, the PEG view is considered unnecessary12. a Swimmers view is obtained in which the arm nearest the x-ray machine is elevated and the arm nearest the plate is kept extended. This view can be difficult to interpret due to overlying bones. For many years flexion/extension views used to be recommended for the clearing of the cervical spine. A number of studies have demonstrated flexion/extension views find fractures with may not be visible on initial plain films, although these fractures are invariably visible on CT. In a review of the NEXUS study data13 86 of the 818 patients with cervical spine injuries had flexion/extension views. Four dislocations and 15 out of 16 subluxations were seen. 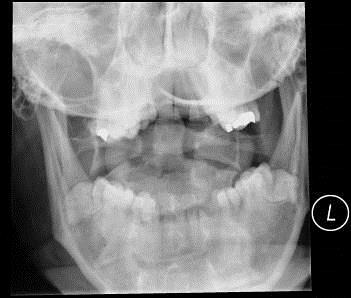 However, all the dislocations and all but four of the subluxations were visible on plain films. These four patients had significant injuries of the c-spine, such that subsequent imaging would have shown these injuries. 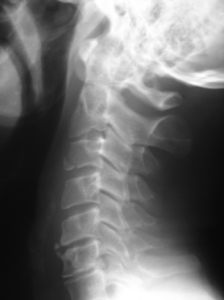 Other studies have demonstrated that flexion/extension views may find injuries which are not visible on plain films, however these patients are either intoxicated or have significant neck pain and the injuries were apparent of CT. Flexion/extension views should not be performed on unconscious / uncooperative patients as there have been cases of paraplegia following this procedure. Clinical bottom line: There is no role for flexion/extension views in the acutely injured neck. 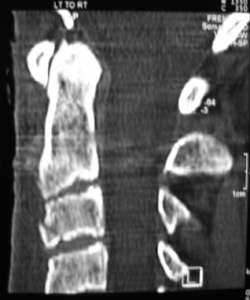 It has been recommended that thin cut axial CT scans with sagittal reconstruction should be used to view areas that were suspicious or poorly visualized on plain radiographs14. 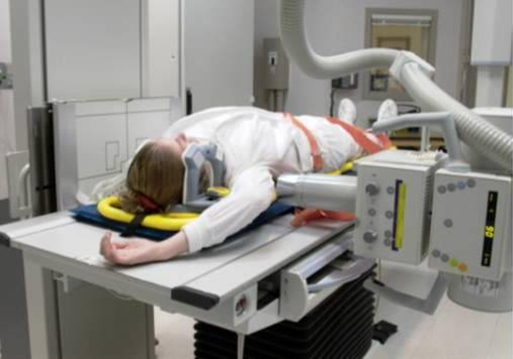 However, the indication for CT scanning needs to be carefully considered because patients undergoing CT of their whole cervical spine have a 14-fold increase in the dose of radiation to their thyroid gland compared with standard three view plain radiography. The recent introduction of spiral CT has reduced radiation dose and is faster, with a reported sensitivity as high as 99% and a specificity of over 93%15. The missed injuries are normally ligamentous, and may only be detected with Magnetic Resonance Imaging (MRI) or flexion/extension views. There are well documented cases of conscious and cooperative patients with normal plain films and normal CT scans who were subsequently found to have unstable ligamentous injury on MRI scanning. MRI scanning is very sensitive for soft tissue injuries including ligament injuries, disc herniation and haemorrhage, which are less well visualised on CT.16 Many of these injuries will not be clinically significant, but a minority will represent unstable injuries. MRI is, however, less sensitive than CT at imaging the posterior elements of the spine and the craniocervical junction. In unconscious patients there is some concern about the possibility of ligamentous instability which may be missed by CT, and so some authors consider that patients should have MRI to clear the spine in these patients. 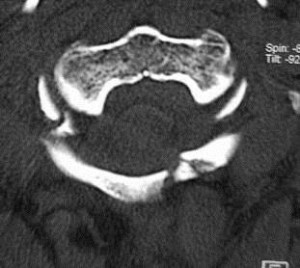 Isolated ligamentous injury in the cervical spine is rare (0.04% incidence of ligamentous injury without fracture17). The incidence in patients with altered mental state is higher, but is still only 0.7%. MRI in an unconscious polytrauma patient is not straightforward, and in many patients may not be practical for many days. The current NICE Guidelines do not recommend that MRI is routinely used to clear the cervical spine. The EAST guidelines from the USA are non-committal, leaving the decision to use MRI up to the individual hospital. Current NICE Guidelines do not recommend the routine use of MRI scanning to clear the cervical spine. 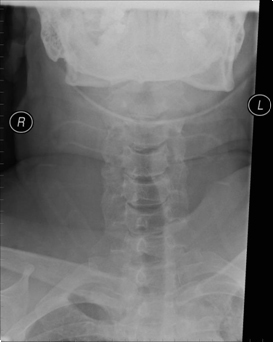 imaging for cervical spine injury is indicated by the Canadian C-spine rule (see recommendation 1.4.7) or there is a strong suspicion of thoracic or lumbosacral spine injury associated with abnormal neurological signs or symptoms. 1.5.7 If, after CT, there is a neurological abnormality which could be attributable to spinal cord injury, perform MRI. 1.5.8 For imaging in adults (16 or over) with head injury and suspected cervical spine injury, follow the recommendations in section 1.5 of the NICE guideline on head injury. 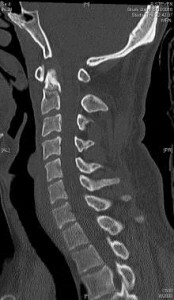 cervical spinal cord injury as indicated by the Canadian C-spine rule and by clinical assessment or cervical spinal column injury as indicated by clinical assessment or abnormal neurological signs or symptoms, or both. 1.5.3 Consider plain X-rays in children (under 16s) who do not fulfil the criteria for MRI in recommendation 1.5.2 but clinical suspicion remains after repeated clinical assessment. 1.5.5 For imaging in children (under 16s) with head injury and suspected cervical spine injury, follow the recommendations in section 1.5 of the NICE guideline on head injury. The current Eastern Association for the Surgery of Trauma (EAST) Guidelines18 from the USA recommend CT as the primary imaging modality for all patients who require their cervical spine imaging. Historically there has been controversy about how to manage simple neck sprain injury (i.e. injury to the neck where there has been no demonstrable bony injury or unstable ligamentous injury) and there have been few trials evaluating specific interventions. A Cochrane review in 200719 reviewed the evidence for conservative management of neck sprain injury (so-called whiplash ). They found that there was insufficient evidence to support or refute the effectiveness of active versus passive treatments to relieve the symptoms of neck sprain injury. There were, however, a number of trials in this review which reported that cervical spine collars resulted in worse outcome than early mobilisation. Although there are no randomised trials evaluating the use of analgesia in the management of neck sprain injury, it would be sensible to recommend analgesia to permit early mobilisation. Patients who have a spinal cord injury should immediately be discussed with the nearest Neurosurgeon or Spinal Surgeon on call by the trauma team leader or senior doctor in charge of the patients care. Insurance and compensation claims have been found to be associated with a worse prognosis. In countries without a litigation culture the prognosis of neck sprain injury is considerably better that in countries with a more litigious system. Regardless of the legal system it has been noted that instruction of a lawyer shortly after a collision is independently associated with slower recovery. The elderly are at high risk of cervical spine injury from relatively minor mechanisms of injury (e.g. 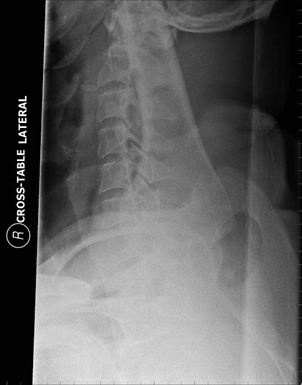 falling from standing): always consider the possibility of a neck injury in an old patient with a fall and head injury. Missed cervical spine fractures tend to occur in patients with distracting injuries, reduced level of consciousness or under the influence of alcohol or drugs. If the patient is holding their neck in a flexed position, DO NOT try to get into a collar. There are many case reports of paralysis resulting from putting patients with Ankylosing Spondylitis into a collar. Benzel E.C, Hart B.L, Ball P.A, Baldwin N.G, Orrison W.W, Espinosa M.C. 1996. Magnetic resonance imaging for the evaluation of patients with occult cervical spine injury. Journal of Neurosurgery 85(5):824-9.